Proverbs 18:9 says, "One who is slack in his work is brother to one who destroys." At first glance, this may sound a little harsh. After all, being slack in our work doesn't feel like we are destroying anything. But while we are not actively destroying, our lack of attention to the work we do can sometimes leave lasting damage. I wrote this verse in the clipboard I use for devotion ideas months ago. 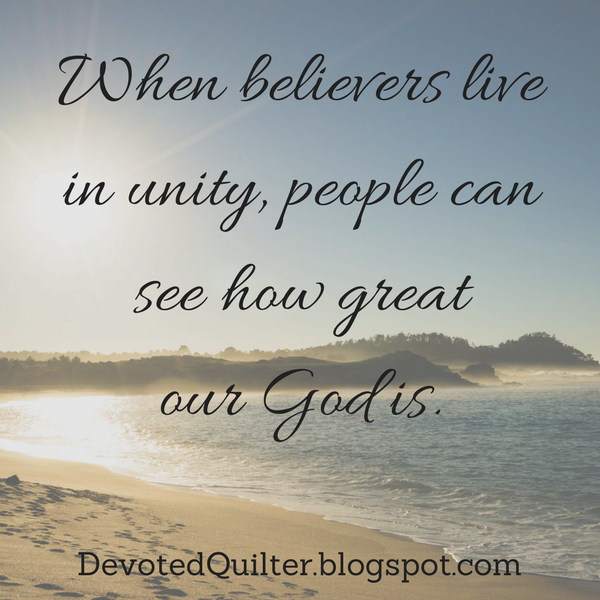 At the time I thought I would use it for a quilting related devotion. The verse has been going through my head all day today, but not with a quilting connection, just a regular life one. As a stay-at-home mom, my work involves caring for my three boys - getting them out the door for school in the morning with healthy lunches and snacks, helping with homework when needed, giving them my time and attention so they know they are valuable to me. My work babysitting three other little ones involves changing diapers for the littlest two, making sure all three eat snacks and lunch, getting the youngest to take a nap (a feat in itself for a child who won't stick to a predictable schedule!) and playing with all of them throughout the day. If I were slack in my work with either my own boys or the three I look after, it would not be an active destruction, but it would do damage. Not caring for them physically, with meals and snacks, clean diapers or appropriate naps, would hurt their bodies. Not giving them my time and attention in a positive way could hurt their self-esteem, their emotional development and their relationships with others as they grow older. Though each little task throughout the day may feel minor and insignificant, all of them together make for a work that needs to be done properly. As I write this on Sunday evening, this verse really strikes home. It has been a somewhat 'off' day for me. You see, Nathan, my youngest, talks A LOT. As in constant. As in sometimes I feel like I am going to lose my mind if he doesn't just stop for a while. I struggle with finding the balance between listening to him, validating his ideas and thoughts, and preserving my sanity by telling him not to talk anymore. Today has been more of a preserve-my-sanity kind of day. I have really just wanted my own space while he has wanted nothing more than to tell me his favourite parts of the show he watched earlier, or to sing me a song or three. I know all parents have days like this. I know I have not been slack in caring for Nathan or any of the others, but today makes me wonder how my moods affect my parenting. How my moods affect Nathan and his development. Thankfully, I also know that it takes more than one day to set how a child feels about himself. And normally I have more patience for listening to Nathan's chatter. It is easy, though, to see how a pattern could develop. A pattern of days with no patience, of not listening to him, of always telling him to go find something else to do. While that would not be actively destroying him, it would be slacking off in the work that is required of a parent. It would be damaging to him, or to any child, in a much more subtle way. So I can see how "one who is slack in his work" could be seen as "brother to one who destroys." Not the same, no, but kin. What is your work, paid or otherwise? How could slacking off in that work be damaging? Though you may not be actively destroying anything, cutting corners or doing less than your best could be making a negative impact on someone or on whatever project you are working on. Would you be working differently if there were a supervisor watching your every move? The Bible tells us, "Whatever you do, work at it with all your heart, as working for the Lord, not for human masters, since you know that you will receive an inheritance from the Lord as a reward. It is the Lord Christ you are serving" (Colossians 3:23, 24). That is our standard for everything we do. Though we will all have 'off' days, days when we just aren't ourselves, 'slack' should not be the word people would choose to describe our work. I've been making bits of progress on several of my projects. 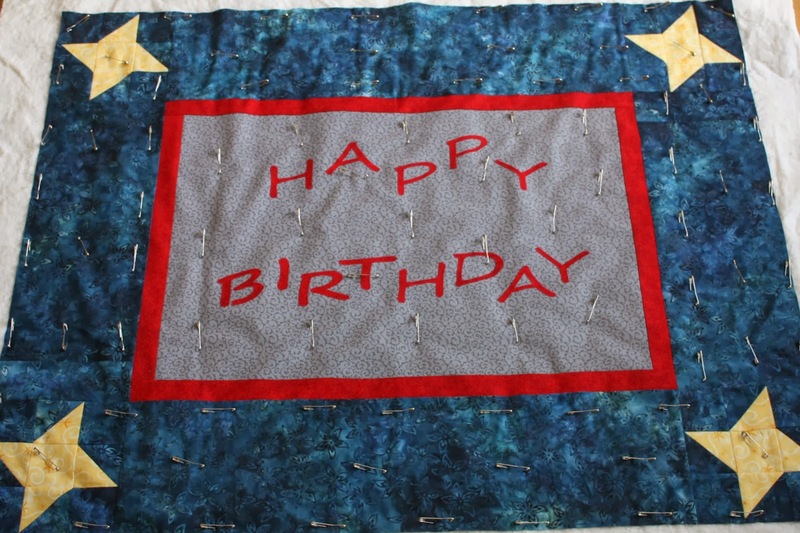 To start with, I've been working on the Happy Birthday banner quilt. I got the top pieced, after a slightly panicky moment when I realized I didn't have enough of this blue batik for the borders. I figure that extra little seam in each side border won't be all that noticeable, right? I also have the letters drawn on the paper side of the fusible web. I'll be using the red of the inner border for the letters. I'm working on writing the pattern for this quilt, so if anyone is interested in testing it for me, email me at piecefullydevoted at gmail dot com. Monday night I did some of the stitching around these snowmen. There are six snowmen (three at each end of the runner) and only one and a bit left to go for the stitching around the body. Then all six need arms so they are actually holding the things currently just floating on their bellies. I have started pulling fabrics for the sewing room block of the And Sew On BOM by Kristy at Quiet Play. This is what I took out of my scrap bag one evening. I still need a bunch of other fabrics, so hopefully I'll dig those out of my stash later in the week. I have my paper foundations all printed and labelled, which will make life easier when I am ready to start sewing all these tiny pieces. As I was labeling the sections I realized the sections are lettered from A all the way to Q - that's a lot of sections. Then I noticed that some of the sections have 10 or more pieces, which made me wonder, "Just how many pieces are in this block, anyway?" So I tallied them all up. See that number circled at the top of the paper? Yep. 117 pieces in one 10" block. I don't know who's crazier - Kristy for designing it or those of us who think it's too cute not to make! I hope to tackle at least a couple of sections of this block before the week is out. We are under a blizzard warning for tomorrow, so maybe that means I'll get a little extra sewing time. Compassion Bloggers are heading to Uganda next week. They will be visiting two Compassion Centers and meeting the sponsored children and some of their families. They'll also be writing about their journey for those of us at home. Their posts will be shared here. Will you pray for these bloggers and the families they will meet? If you would like to sponsor a child through Compassion, click on the picture on the sidebar or go here. Fresh snow fell Thursday night/ Friday morning, so this afternoon we strapped on our snowshoes to take advantage of it. This trail runs right behind our house to a cliff overlooking a brook, which is usually where we stop. This year we decided to tackle the steep hill taking us down to the brook. I love the sound of running water! We walked along the brook for a while before heading back home. Without lugging a tripod or finding a perfectly placed rock, this is the best we could do for a family picture - with Mom, then with Dad! By the way, did you know Craftsy is having a flash sale this weekend? Quilter, as a group, are quite generous. When a tragedy occurs, quilters step up to blanket the victims in love. Lately, this has become a rather regular occurrence. Just since I have started blogging there have been quilts collected for West, Texas and for Moore, Oklahoma. Flags were donated to show love and support to the city of Boston and more quilts went to the people of Alberta. Sarah, of Confessions of a Fabric Addict, regularly shares the quilts made and donated by her church's quilt ministry. There are many other avenues for donating quilts, like Project Linus or Siblings Together. The do.Good Stitches bee works like any other online bee, but their finished quilts are donated. I found this verse from 2 Corinthians to be interesting when I read it the other day. "For if the willingness is there, the gift is acceptable according to what one has, not according to what he does not have" (2 Corinthians 8:12). The phrase 'for if the willingness is there' practically jumped out at me. God doesn't look only at what we do, but also at our thoughts and feelings about what we do. We can give and give and give all day long, but if we're grumbling in our hearts and heads, our giving is not acceptable to God. He wants us to give willingly. In the next chapter of the same letter, Paul wrote, "Each man should give what he has decided in his heart to give, not reluctantly or under compulsion, for God loves a cheerful giver" (2 Corinthians 9:7). So, God wants us to give, but we shouldn't be giving because we feel we have to or because everyone else is giving to a particular cause. God wants us to be giving because we want to give. Of course, we also can't just feel willing to give without actually giving anything. Both the willingness and the gift have to be there. And if we are willing to give? Then the acceptability of what we give is measured according to what we have available to us. A person living on a small income who can only give a little shouldn't feel guilty for not being able to give as much as a person with a six-figure salary. Likewise, a quilter who sews in her spare moments and donates a couple of quilts a year shouldn't feel inadequate compared to a retired quilter who sews pretty much all day and has a stash to rival her local fabric store. Jesus Himself shared this principle when He sat watching people putting money into the temple treasury. "Jesus sat down opposite the place where the offerings were put and watched the crowd putting their money into the temple treasury. Many rich people threw in large amounts. But a poor widow came and put in two very small copper coins, worth only a few cents. Calling his disciples to him, Jesus said, “Truly I tell you, this poor widow has put more into the treasury than all the others. They all gave out of their wealth; but she, out of her poverty, put in everything—all she had to live on'" (Mark 12:4-44). Though the widow's offering was tiny in terms of what it could buy, it was huge in terms of her faith and her willingness to give whatever she could. Where are we with our giving? 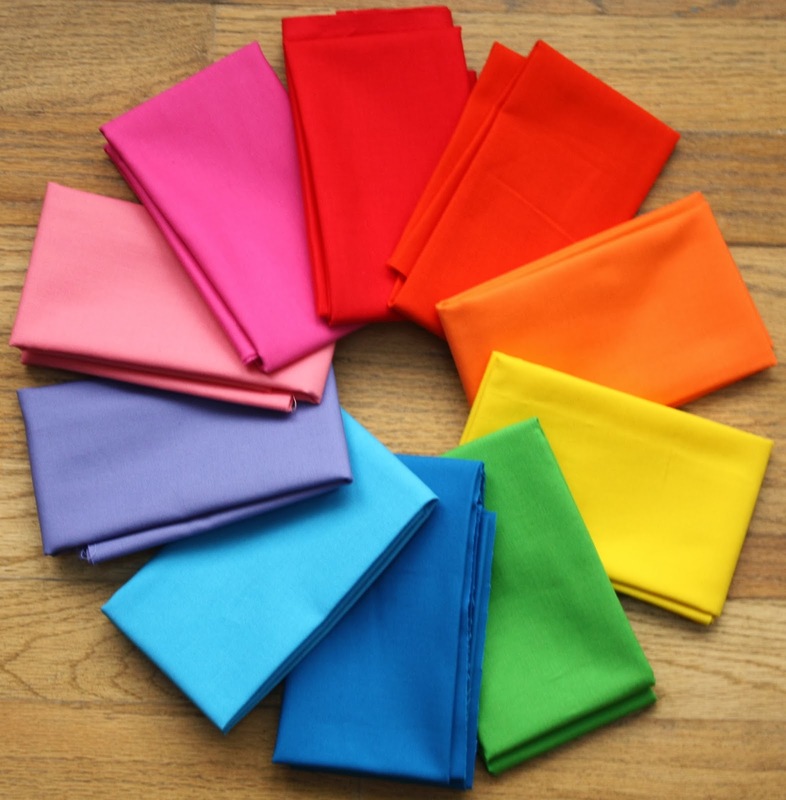 Whether we donate quilts or time or money, what is our attitude as we give? Are we cheerful givers, excited to be able to share some measure of what we have? Or are we giving only because it is expected of us, all the while thinking of what we could be buying with that money if we kept it for ourselves? What about the proportion of what we give compared to what we have? Our tendency, I think, is to compare ourselves with others who have more than we do, making us feel that we don't have much we can share. If we were to take an unbiased look at our own resources, would we find we are better able to give than we thought? Many would probably have looked at the widow and thought she was crazy for giving as much as she did, and yet Jesus commended her actions. Would He commend us for our giving? I know, Christmas is well over and we're moving forward into 2014, setting goals and all that stuff. But I have one last Christmas post to share and then I'll join right in with the goal setting. After all, the linky for the first quarter of the Finish-a-Long 2014 opens on the 7th! Every year I make one ornament for each of my three boys that reflects something important about his year. The ornaments are cross-stitched, except for one of Aiden's, because I couldn't find a pattern at the time for a phone (his favourite toy that year). These are surprises that I hang on the tree Christmas Eve for them to find in the morning. Here are Aiden's ornaments, in order from 2002 to this year. Some of them need a little explaining when people are looking at our tree. Like the big poppy with Lest we Forget written on it. Aiden has been interested in the military for years, especially military history and both World Wars, so his ornament for 2009 reflected that. The tent is the only ornament I gave all three boys the same year, marking the year we bought a tent and started camping. This year I made Aiden a set of drums to commemorate his love of drumming. These are Zachary's ornaments, from the dolphin in 2004 to his love of science experiments this year. When I asked him what he wanted for Christmas this year, his response was, "Well, I like engineering." What were we supposed to do with that?? His love for insects made it onto the tree in the form of a spider (not your usual Christmas decoration, I know), and last year's obsession with reading mysteries resulted in the book with a ? on it. These are Nathan's ornaments. You may have noticed that all three boys have the little chalkboard, which marks their first year of school. Being rather smart, Aiden and Zachary had already figured out that Nathan would be getting that this year. The worm in the apple for 2008 was because Nathan was the squirmiest worm of a baby that we have ever seen. He simply could not stay still unless he was sleeping. Plus, he loved to eat, a fact which was further noted with the seagull the next year. Remember the seagulls in Finding Nemo? "Mine, mine, mine!" That was Nathan's reaction anytime he saw anyone with food. Though he couldn't actually talk at the time, he toddled over to whoever had the food and made it very clear he expected them to share. Mine, mine, mine! I started these collections thinking it probably wouldn't interest the boys much while they were kids, but eventually they'd grow up and their wives at least would be interested. Plus it was something unique I could give them. What I think is wonderful is how much they do enjoy their ornaments. Some years they start asking if I know what the ornaments will be as early as October. Other years they make suggestions for what they think they should get. There. We actually took down our tree and all the other decorations yesterday, but I kept these out so I could take pictures to share. Now Christmas can be officially put away for another year. By the way, this is my 100th post! Wow! Thank you so much to everyone who reads my little blog, and especially to those of you who comment. It is so much fun to share my quilting (and other stuff) and to 'meet' new friends around the world.